I saw the Tarte Light of the Party Collectors Makeup Case on Instagram long before it released and I knew that I had to have it. Sequins and rose gold will get me every time. Zip open the soft case and you will see, in the lid and insert in this year's Happy Holidayz design, inset are a snack size Tarte Lights. 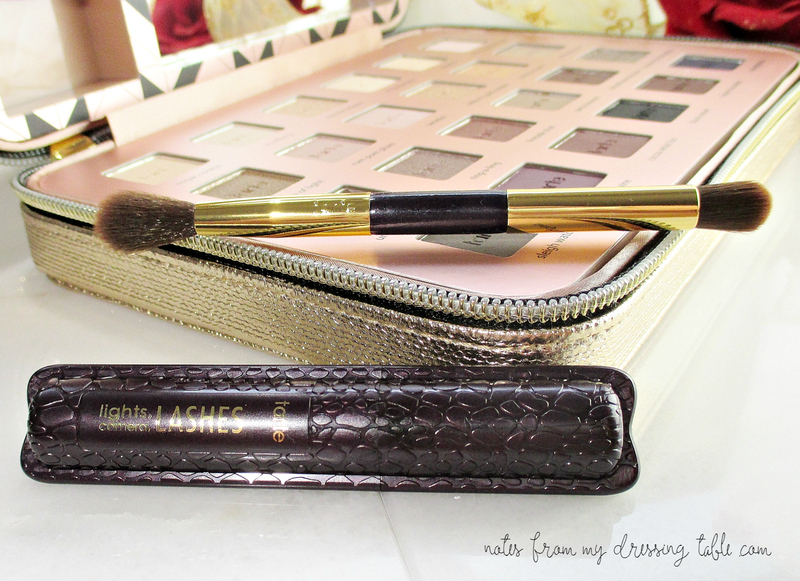 Camera, Lashes Mascara, a travel size double ended eye shadow brush and a card stock pull out palette that covers a mirror. In the lower well of the palette are twenty-four small eye shadows. All of the shade names are clearly stamped on the trim both on the main and smaller palette. Good job, Tarte! No having to keep track of stupid plastic slip covers or tossing them and never again knowing the names of my shadows. Just a close up of the snack sized mascara and double ended brush. I like the mascara formula, a lot. I have quite a bit of it, around and I'm always happy to get more of it. The brush... Well, you know what I think of double ended brushes. The quality of this one is serviceable. I don't know if it is worth giving a haircut. The little gold and silver card stock palette pulls out and reveals a good sized mirror, big enough to do a full face, if you're flexible. The palette is sturdy and slender, easy to slip into a drawer or carry on. In the mini palette are a 0.20oz Amazonian Clay Bronzer in Social Butterfly and Blush in Amazed. (Full size are 0.2 oz.) A gorgeous, good sized face/eye highlighter in Pink Champagne and six eye shadows. I inserted swatches, in order from bronzer to last eye shadow. The bronzer and blush both perform as you would expect Tarte Amazonian Clay bronzers and blushes to perform. The shades are wearable for many skin tones. 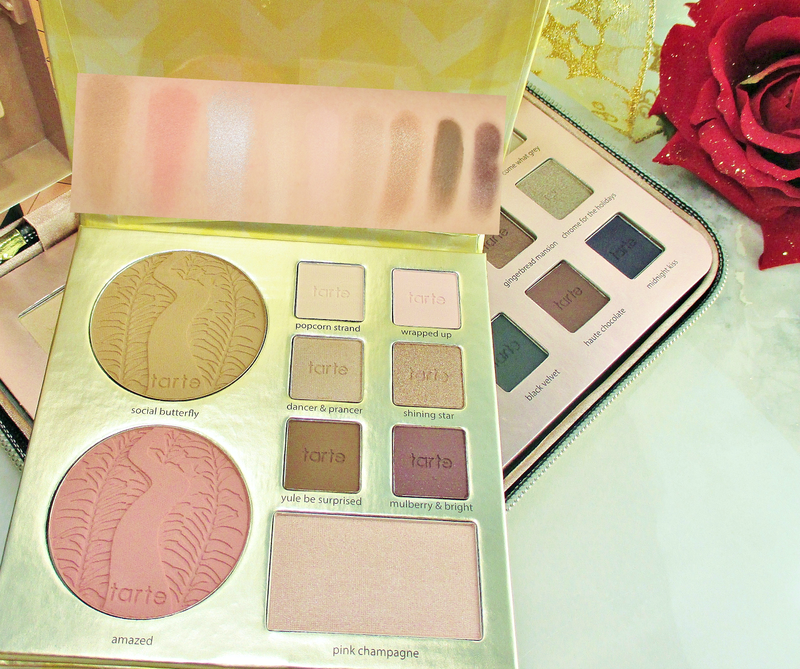 The eye shadows in this portable palette are very good, the mates are soft and creamy, the shimmers velvety and all of them have the pigmentation and payoff on the eye one would expect from Tarte eye shadows. They apply, blend and build on the eye beautifully with little fallout. My brush does kick up come powder and flakiness when I pick up colour. 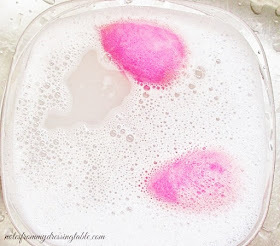 Pink Champagne is a lovely highlight! 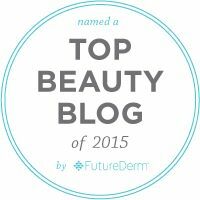 If you like a cooler, pink toned highlight, this one is for you. Versatile, it can be used on the eyes or the face, applied lightly or piled on, whatever makes your heart sing. This highlighter is luminous and shimmery but it isn't a glitterball. In the lower section is a rose gold section is twenty-four small neutral shadows in various textures and finishes ranging from matte to shimmer, metallic and a little glittery. Most of the shadows are nicely pigmented and give good payoff and perform well on the eyes. Some of the shadows are a little stiff and require a bit of work to build or blend, I experienced some fallout from some of the darker shades. If I am planning to do a darker, more intense eye look with any shadows, I do my eyes before I apply my foundation. I suggest that you take that precaution with these shadows if you are going to go full on smoky evening glam with this palette. I get a little fallout from a couple of the chunkier shimmers but it brushes away easily, so no biggie, there. Here are some random swatches from the Lower Twenty-Four. I just dipped and dotted a representation of the selection of shades and tones available. As you can see, these shadows are pretty neutral fare. Pretty and wearable. 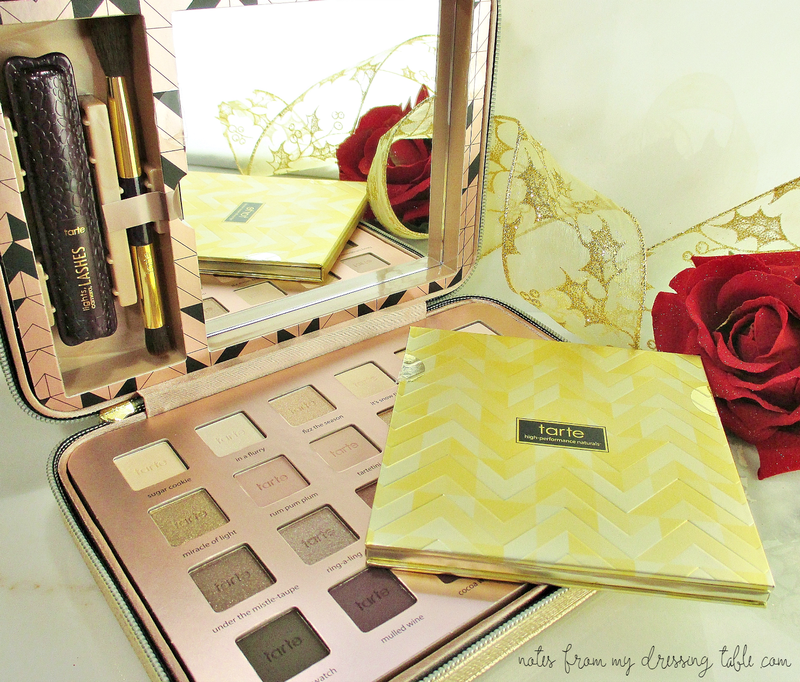 The pluses of the Tarte Light of the Party Collectors Makeup Case are most definitely the glitzy, pretty, pretty packaging. 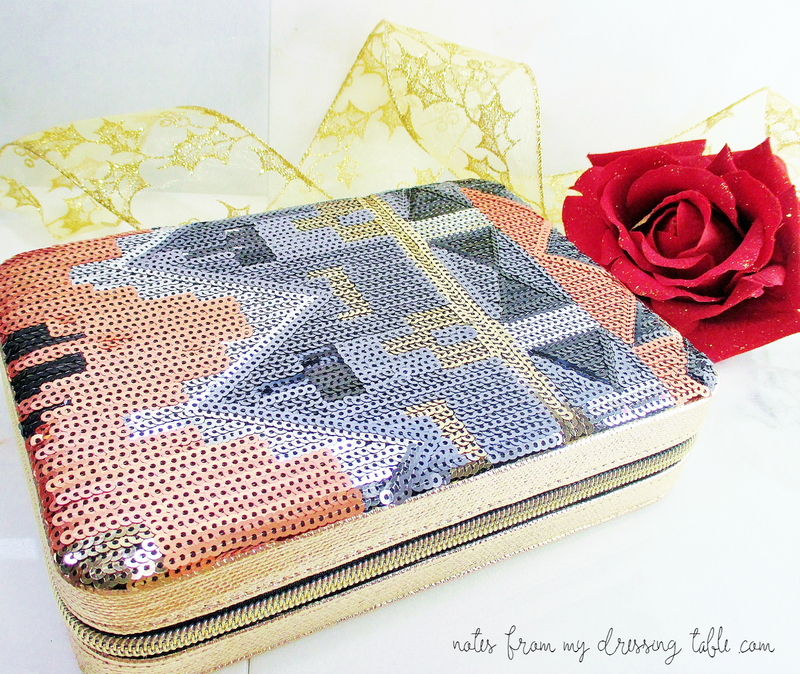 That rose gold and sequin patterned top are eye catching and fun to have on my dressing table. The pull out palette is portable, easy to stash, the quality of the makeup contained within is top flight and not to be missed. I love having twenty-four shades at my brush's disposal when it is time to do my makeup. I mean, how decadent is that? All of the shades are wearable, blendable, pretty and appropriate for any occasion and should flatter just about every skin tone. There are a few drawbacks: The inserts are very well affixed inside the soft case. Removing them would be a difficult task. I dislike how the lid insert looks now that the brush and mascara are removed. That is always a bummer of these sets; when you remove the pieces, you are stuck with weird shaped dead spaces that just look forlorn and get me to thinking about Z Palettes and depotting sessions. If you are someone who likes bright, jewel or fun colours, this makeup set is not for you. These shades and tones are neutral. Now, if you or the person for whom you are buying this lovely collection dig neutrals, this palette is definitely going to delight and inspire! The quality is good, the selection is extensive and the packaging is downright sparkle plenty. 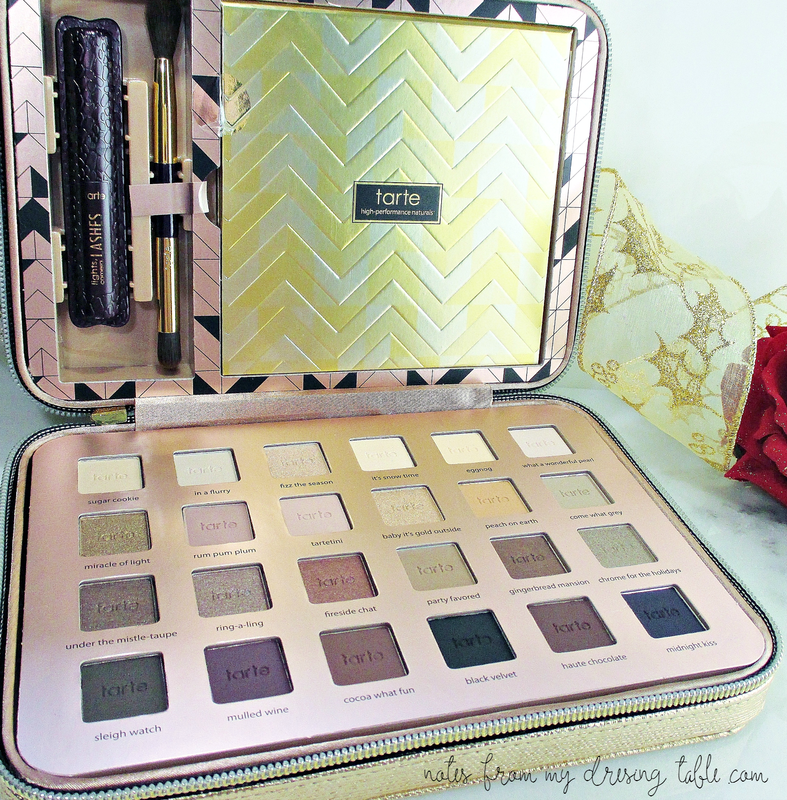 I am not sorry that I bought the Tarte Light of the Party Collectors Makeup Case. I am enjoying it. I suggest it for you neutral lovers and as gifts for the neutral lovers in your life. 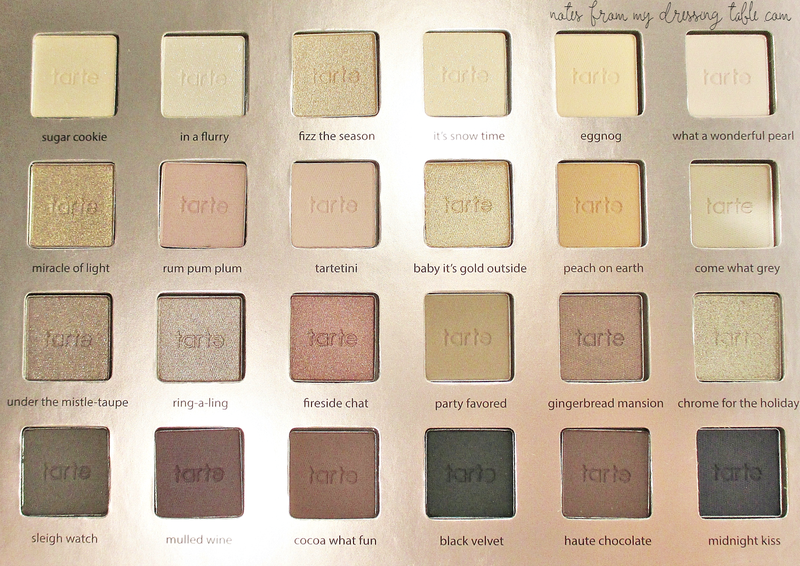 Tarte is cruelty free, free of Parabens and Phthalates. Did you pick up this makeup collection? Thinking about it, either for yourself or as a gift? I just want to say, I am not the one who centered the text in this blog post. This is the dastardly doings of my blog host platform. What. The HELL??? ?